Mr. (b. 1969, Cupa, Japan, lives and works in Saitama, Japan) approaches the visual language of anime and manga as a means of examining Japanese culture, fusing high and low forms of contemporary expression. 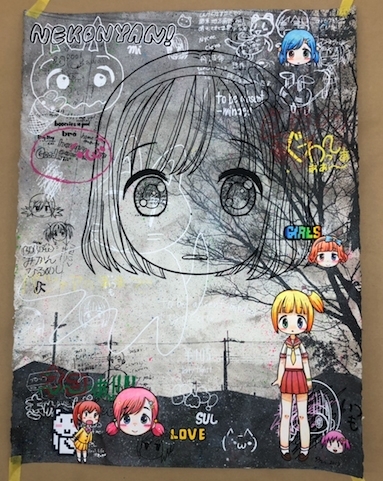 Like his fellow Superflat artists, such as Takashi Murakami, Mr. utilizes otaku, the "cute" Japanese subculture that is marked by an obsession with adolescence, manga, anime, and video games. Alongside his interest in otaku is an engagement with the 1960s Italian art movement, Arte Povera. Inspired by these artists’ use of unconventional materials and purposeful amateurism, Mr.’s earliest magna-style paintings and drawings were on store receipts, takeout menus and other scraps of transactional detritus. Mr. graduated from the Department of Fine Arts, Sokei Art School in Tokyo in 1996. Solo exhibitions of his work have been organized at Seattle Art Museum, WA (2014); and Musée d’Art Contemporain de Lyon, France (2006). Select group exhibitions featuring his work include Animamix Biennale 2015-2016, Daegu Art Museum, South Korea (2015-16); Kyoto-Tokyo: From Samurais to Mangas, Grimaldi Forum, Monaco (2010); Animate, Fukuoka Asian Art Museum, Japan (2009); KRAZY! The Delirious World of Anime + Comics + Video Games + Art, Vancouver Art Gallery, Canada (2008); RED HOT: Asian Art Today from the Chaney Family Collection, Museum of Fine Arts Houston (2007); and Little Boy: The Arts of Japan’s Exploding Subculture, Japan Society, New York (2005). Mr.'s work is in numerous international public and private collections, including the Philadelphia Museum of Art, the Seattle Art Museum, and Daegu Art Museum, South Korea.